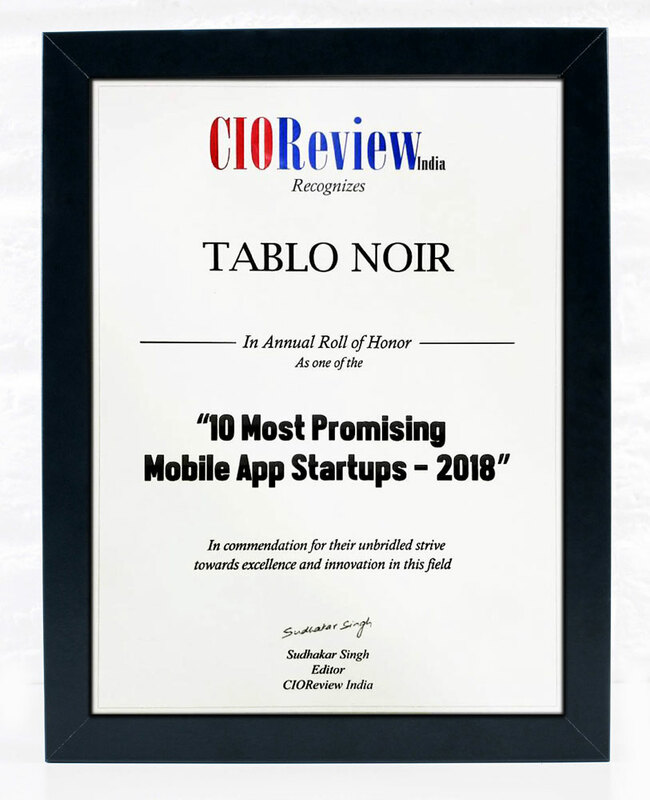 We are thrilled to announce that CIOReview has recognized Tablo Noir as one of the 10 most promising mobile app start-ups of 2018 and has awarded us an Annual Roll of Honour! Based out of Bangalore, CIOReview is a great platform for businesses to showcase groundbreaking development in their respective fields. After a rigorous and thorough scanning of potential candidates, we are honoured to have been chosen by CIO Review for the Annual Role of Honour! We are ecstatic and humbled by the fact that we are the only agency from Chennai to be a part of this prestigious list. A big thank you to our clients for believing in us, to bring out innovative mobile-friendly websites and apps that aces in both design and development! An even bigger shout out to our awesome team for the continuous brainstorming of brilliant ideas, which has brought us this far! Tablo Noir is more than just a design and identity studio. Do get in touch with us to bring to life more hopes and dreams.